How would I know if a meterorite was falling towards me? If there were a large object, say a meteorite falling straight down where I'm standing, what kind of warning would I notice? Would there be an accompanying sound that could warn people on the ground? Or would I not know until it's too late? We put this question to Dr Mark Lewney, who gained his PhD in Acoustics from Cardiff University... Mark - For most of us here on the Earth's surface, the speed of sound is around 340 m/s or 750 miles an hour. That's one mile every 5 seconds which is actually not all that fast. It's only about twice the speed of the fastest arrows in archery. Sound is also even slower in colder air and the air altitude is both colder and much less abundant. So when the meteoroid, the lump of rock itself enters the atmosphere 100 km up and becomes a meteor, it will always be too far away to hear. It's possible that its electromagnetic waves travelling a million times faster than its sound waves will cause a hissing noise in phones or radios, but even this so-called electrophonic effect is debatable. But Daniel asks not about a meteor which burns up in the atmosphere but a meteorite which actually makes it all the way through the atmosphere to the Earth's surface. Would this give any warning? Sadly, no. It will be travelling at least 11,000 metres a second, 33 times the speed of sound, far too fast to hear its approach. In fact, we probably wouldn't be able to see it either. 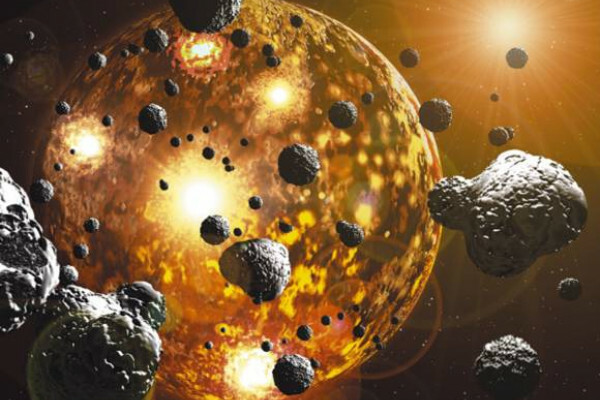 Only a tiny fraction of the solar system's asteroids are currently being tracked by just a handful of volunteers worldwide. So unless it reflected the light in just the right way in a small region of the sky that someone happened to be looking at very carefully, it would almost certainly be too small and too fast to see until it entered the atmosphere just a few seconds before impact. I'm afraid Daniel's final moment would be rather disappointing. Hannah - Poor, Daniel. Mark adds that it is possible that the meteorite will burn up just enough to be decelerated by the atmosphere to subsonic speeds. But that this would leave a meteorite so tiny that getting killed by it would be a bit embarrassing. Previous Do genes delivered by gene therapy get inherited? Next Could use our own waste as a source of power?